I would recommend the '5 Steps to a Roadie Job' online course as a first step for everyone who would like to work in the live music industry. During 5 brief chapters Andy explains everything what we need to know before we attempt to make our own way into the business. All the explanations and examples are pretty straightforward. I am sure it won't be difficult to anyone who interested in this hard but amazing profession. Thank you and good luck! This is a great course to find out what you ned to now to get a job working on tour with bands. it does not tell you specific things, like how to do the actual job, but tells you how to learn those skills, where the work is and who does the hiring and firng. Very good! I have been involved in the music industry for 25 years as live audio engineer, concert tour manager, lecturer, and author. As concert tour manager and live audio engineer (FOH and monitors) I have worked for numerous international touring acts, including Maribou State, Maverick Sabre, The Pierces, All American Rejects, House of Pain, Machine Head, Nightmares On Wax, Pavement, Roots Manuva, Super Furry Animals, Skunk Anansie, and Squarepusher, to name but a few. Ive been touring with these kinds of contemporary acts for nearly 30 years, and I'm just beginning to know what I'm doing. That touring experience has seen me doing gigs in stadiums, arenas, theatres, pubs, bars, clubs, outdoor festivals, rooftops, subway stations, cruise ships, mountain sides and very, very muddy fields. I have two books published, ‘The Tour Book – How To Get Your Music On The Road’, which is required reading at many colleges and universities that teach music management, including Berklee College of Music, and ‘Roadie, Inc. How To Gain & Keep A Career In The Live Music Business’. I have also written for several magazines and have been interviewed about the live music business for print and radio articles. I have taught live sound engineering and concert tour management for nearly 10 years now, at colleges and universities, including University of West London/London College of Music, Access to Music, The Institute of Contemporary Music Performance,and Buckinghamshire New University. I hold a Post-Graduate Certificate in Learning & Teaching in Higher Education, which basically means I know how to create and deliver great teaching. I have also run sessions and workshops about the live music business for other organizations including the Audio Engineering Society. Please email me with any concerns, questions or suggestions about the course. I'm based in London, England and am also on tour a great deal, so please allow a couple of days for me to get back to you. You know how great it will be working with bands on tour, but are you frustrated because you don't know where to start? Then its time for you to follow this step-by-step plan so that you can travel the world, work with incredible musicians, and get paid for it. You are really interested in working as roadie, going on tour with bands. However, you cant find out how to get started, and you are worried that you don't have the necessary skills or experience to get you the job. In fact, you don't really know what skills and experience you need - most Internet resources simply say its hard, manual work, or that you will be ‘setting up sound and light equipment’. Doesn't really help you much does it? That's why I’ve written this course - to give you the information you need in order to get started as roadie, working with bands on tour. The course is meant for people, like you, who have absolutely no idea of how to get started. And, in case you are wondering, you wont need any ‘roadie’ experience or other training to start with, as you will be told what skills, experience or training which will be useful to you in step 3 of the 5 steps. The online course for people who don't know where to start to get a roadie job, with a 60-day money back guarantee. The 5-Steps to A Roadie Job course is a beginner’s guide to getting road crew work with bands on tour. 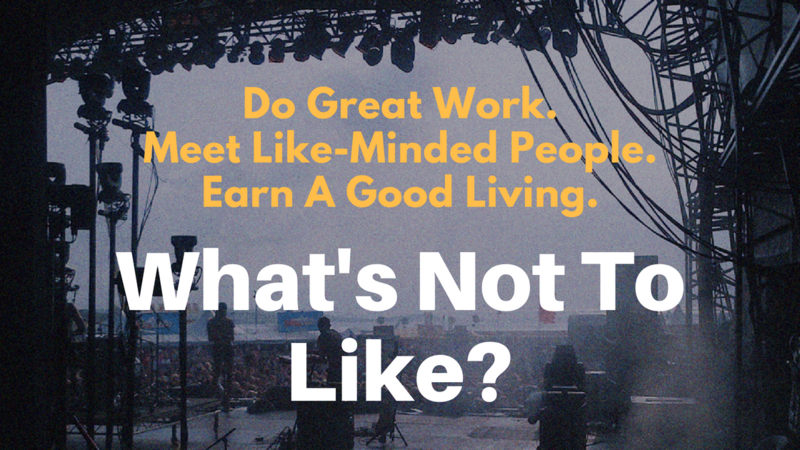 Following the 5 simple steps will enable you to earn a full-time living as a live sound engineer, touring lighting person, concert tour manager, backline tech, or other touring crew job. The next step to your road crew career is the first step of the 5-Steps to a Roadie Job course! “A fascinating and enlightening book which explains in the plainest terms the entire process of how you get your band from an idea through to a big gig - a must buy for any aspiring musician”. Geoff Meall, Booking agent for Muse, Sum 41, Don Broco, and Super Furry Animals. “A fantastic book that helps answer all the questions for a person wanting to join the live music business”. Mark Wynn-Davis, Lighting Designer for Jamiroquai. “I’ve probably seen a least of dozen books (that are) usually filled with “helpful” hints, by someone who’s never toured. But this one’s different; Reynolds actually KNOWS what he’s talking about. The book is loaded with practical advice, hints, and tips”. “Finally a book that can give an honest and realistic approach to working in the live entertainment industry. Gives great insight into what is an unusual business without promising an easy path to success. Breaks down some of the myths of working in the music business without making it sound demoralising”. Steven Douglas, Show Designer and Lighting Director for The Killers, Watch The Throne Tour with Jay Z & Kanye West, Kylie Minogue and others. “This will definitely be of great assistance to anyone trying or planning to get into the live music /touring world today." Noel Kilbride, Tour Manager for Nightmares On Wax, Pavement, Roots Manuva, The Kills and others. This course is a series of lessons that lays out 5 steps you can take to start, as a complete beginner, to get jobs working with bands on tour. The course is online, and comprises of 29 video lessons (average 5 minutes long), with commentary. You get access to the videos when you enrol, and they are yours to view forever. Also included is a workbook that you can download when you enrol in the course, which you can use to follow along with the video lessons. You also get supplementary materials (example contracts etc) in PDF format. Finally, the script for the video lessons is included as an ebook, which again you can download and use to follow along. I don't have any relevant skills, or experience of the music business. Can I be a roadie? Yes, you can. The course gives you the information you need to get roadie jobs. Although it does not teach you specific job skills (such as mixing live audio for instance) it tells you how to get the work, and details of the the two roadie jobs you can do straight away, without any kills or experience at all. My dad/boyfriend/an old roadie I know says you can't teach this stuff, and that most roadies ‘fell into it’. Is that right? Good question! Well, Ive been touring for over 25 years, as audio engineer and concert tour manager. Until recently I worked on a an average of 6 tours/250 shows a year. I’m semi-retired now and do a lot of teaching about the live music business at colleges and universities. I still tour and work for bands at gigs and events though and, most importantly to you, help people to start out doing what I do. The course comes with a 60-day, money back guarantee. So, if you let me know at any time during the 60 days after you purchased the course, I will refund the amount you paid for the course (less any card transaction fees or any other cost I may have incurred during the refund process). You wont be able to access the course any more though, which will be a shame. Start your touring road crew life - enroll in the course today! Imagine: you are traveling around the world, working with incredible musicians, meeting music loving-people and being paid up to $200,000 a year to do so. Learning how to get a job as a roadie will enable you to turn your passion for live music into a full-time, high earning career. The Wall Street Journal (1) recently reported some road crew earning $200,000 a year, with the average ‘roadie’ earning at least $60,000 a year – that’s more than the average US household wage (2). Step 5: Do A Good Job And Get More Road Crew Work – it really is that simple, and following these steps will help you do that. 1.Shah, N. (2015). Roadies: Unlikely Survivors in the Music Business. Wall Street Journal, 19 March. [Online]. [Accessed: 24 March 2016]. 2. Anon. (2016). Household income in the United States. [Online]. [Accessed: 24 March 2016]. Lesson 1: Introduction to this step, and why you need to know about the live music business on order to get a roadie touring job. Lesson 2: The Artist Management, the Booking Agent and the Promoter. Discover how their work will affect you. Lesson 3: The Show Booking Process. Shows and tours need to be arranged, and then finalised – this lesson will show you how it’s done. Download - The 5 Steps To A Roadie Job Workbook. Your workbook – use it to follow the lessons and to make notes. Supplementary Materials 1 - The Contract. An example show contract for you to download and study. Supplementary Materials 2 - The Contract Rider. An example contract rider for you to download and study. Lesson 1: Introduction to step 2. There are in fact three separate groups of crew – the house crew/stage hands, the artists touring crew and the suppliers touring crew – and this lesson will show the difference between them. Lesson 2: House and Local Crew/Stage Hands. The first of the three types of concert crew – who they are, and what they do. Lesson 3:The Artist’s Touring Crew. The second of the three types of concert crew; find out why these are the jobs you really want in this lesson. Lesson 4: The Suppliers Touring Crew. Get to know about the third section of the touring crew community in this lesson. Lesson 5: How To Join These People On-The-Road. You now know about the live music business, and this lesson will give you information on how to start getting touring road crew work. Supplementary Materials 3 - Stagehands/Local Crew. Information for you to download. Supplementary Materials 4 – Security. Information for you to download. Supplementary Materials 5 - Responsibilities Of The Tour Manager. Further information for you to download. Lesson 2: Planning Your Freelance Business - The Workbook. The work book is for you, to help you with planning your freelance road crew business. This lesson describes how to best use it for your planning. Lesson 3: Planning 1 - Where Are You Now? Lesson 4: Planning 2 - Where Do You Want To Be? Lesson 5: Planning 3 - How Are You Going To Get There? The workbook has helped examine your skills, experience. This lesson will find more training or education for your road crew career. Lesson 8: How Long Will It Take (To Set Up Your Road Crew Business)? This lesson contains a suggested time of how long it’s going to take to get up and running. Supplementary Materials 6: Live Sound Course Requirements. A list, for you to download, of the suggested teaching on any live sound engineering course you may wish to study. Lesson 1: Introduction to this step. This lesson also contains a couple of activities I have identified that all touring crew take in order to get their first work. Lesson 2: Getting Hired By People Outside Of Your Local Network. The next part of this step is to get work from outside of your immediate network – discover how in this lesson. Lesson 3: Initial Interest From Your Own Web Site. Having your own website is vital to getting road crew work – find out why in this lesson. Lesson 4: Initial Interest Using Email Marketing. The next part of this step is to use email marketing to attract new clients for your road crew business and you will discover how in this lesson. Lesson 5: Initial Interest Using Social Media. Other small businesses have learnt the value of social media, Facebook, Twitter, LinkedIn, Instagram and YouTube, to find and keep customers – you will do the same in this lesson. Lesson 6: ‘Brochures’. Get the information you need in order to create the other marketing materials you need. Lesson 7: Résumés. There are two types of résumé – and one is useless for getting touring crew work when you are starting out. Discover which one in this lesson. Supplementary Materials 7 - Networking. Details on networking for you to download and study. Supplementary Materials 8 - A Word About LinkedIn. LinkedIn is an invaluable resource when used with care and tact, find out how in this download. Lesson 1: An Introduction to this step. Lesson 3: Rates Of Pay. This lesson will tell you how much to charge for your road crew work. Lesson 4: Book Keeping. Don’t let your business get on top of you – use book keepers to chase invoices and pay bills. Details in this lesson. Lesson 5: Strategies For Getting More Work. The strategies outlined in this lesson will enable you to keep touring, and getting paid. Lesson 6: Get Those Recommendations. One of the most important strategies for more work is to get recommendations, and so this lesson is devoted to how and why you should do this. Supplementary Materials 9 – Services. An example of the kinds of services you may specify in a contract of employment.